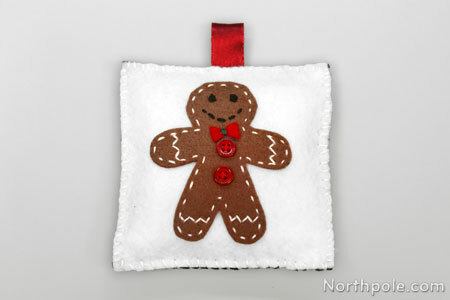 These mini pillows are adorable handmade Christmas ornaments that can be used to decorate many spots in your house in addition to your Christmas tree. Hang them on a banner or suspend them in the air in a window or doorway with fishing line. 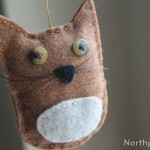 These wee ornaments also make wonderful handmade gifts. If sewing is not really your thing, you can use stencils and paint instead of sewing the appliqués. 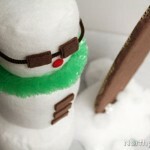 In lieu of Christmas characters, use block letters to spell out holiday words such as “PEACE” or “JOY”. 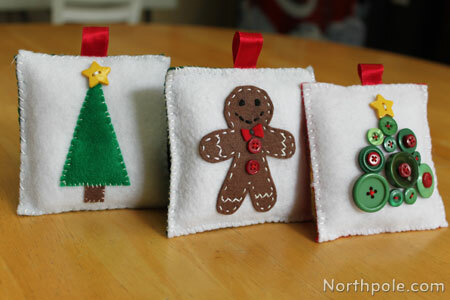 These ornaments will make a nice addition to your holiday decor! Print out template and cut out pieces. 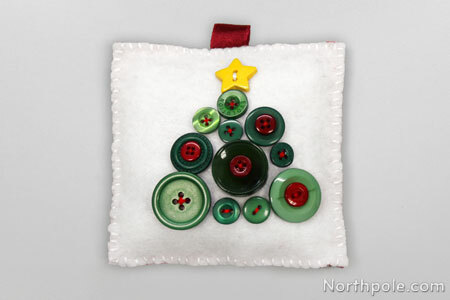 Be sure to cut out two squares for each ornament that you are making. Cut a 3.5" square of batting. Set aside. Cut a piece of ribbon that is 4" long. Set aside. Pin the template pieces to felt. If you don’t have pins, you can trace the template with a marker. Cut out felt pieces. Remove pins and set aside. Pin appliqué to square, if desired. Sew appliqué to the square. Embellish with buttons, beads, or sequins. 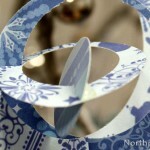 Fold ribbon in half so that it creates a loop. Pin ribbon to felt square so you can sew it when sewing the pillow together. Sew three sides only. As you sew along the top edge, be sure to sew the ribbon loop. Remove pin that was holding the ribbon and set aside. Fill pillow with batting or Poly-fil®. Continue sewing to complete the pillow. Tie a knot in thread, feed into pillow, and trim the thread. For more details on this technique, see this article. Sew bow tie and buttons to gingerbread man. 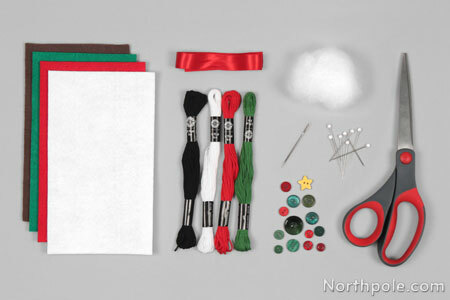 Use red or green floss to sew the buttons and the bow tie. Cut a length of black floss. Do not separate the strands of floss since you want the eyes to be full and round. 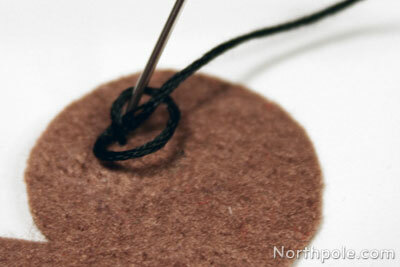 To sew the eyes, poke needle up (to the front of felt) and tie a VERY loose knot in the floss, near the felt. Place felt on a flat surface. 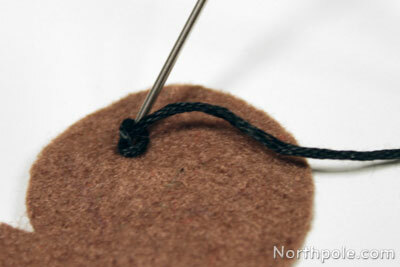 Put needle in the middle of the knot loop and point the tip of the needle into the felt (where the floss meets the felt). Pull the floss to tighten the knot. (But not too tight! You want the knot to be a little loose). 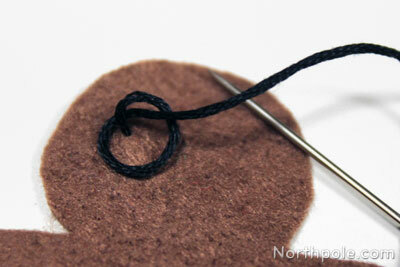 Sew a few stiches to fill in the knot and to secure it to the felt. Note: You could use little buttons for eyes, if desired. Add any other decorations that you would like. Sew appliqué to square with white floss. Follow steps 7–11 (above) to complete the pillow ornament. Select buttons that you are using and arrange them on your felt square. Rearrange as needed. 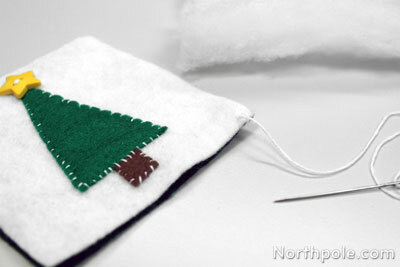 Move buttons off felt, but keep it in the tree shape. 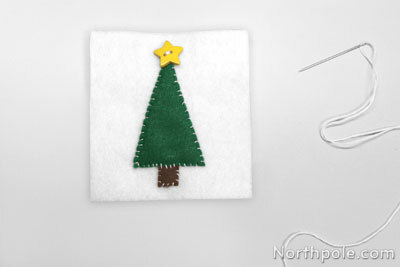 Begin sewing tree, one button at a time using embroidery floss. As you continue adding buttons, and be sure that the thread is pulled taut in between buttons. Decorate your pillows with beads, glitter, rick rack, or sequins. These cuties can be made from fabric as well. If using delicate fabrics, use interfacing to add stability. You can use fusible webbing to add fabric appliqués. 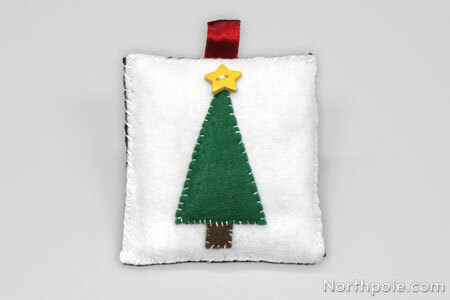 Add these felt appliqués to your Christmas cards for a special handmade touch. If you don’t have floss, you can use multiple strands of sewing thread. Note that using thread can produce a slightly different effect than floss. We have noticed that the individual strands of thread tend to separate while sewing, but we can usually correct it by nudging the strands over with the needle. This workaround is a little inconvenient, but we don't mind so long as it saves a trip to the craft store.